Your lucky yourself chap. Could have been more than a few opamps that would have been fried. Cricklewood were selling them bout 6 months ago for £3.50. i kid you not. i think they realised after i ordered 20. They had the intersil CA3280G and RCA CA3280H. Damn, today I found out that I didn't buy the phone jacks and that Mouser doesn't sell them anymore. Is there an alternative for the Kobiconn 161-3525? Mouser only has a 161-3525L-E which according to the datasheet is totally different and won't fit the PCB. Edit: Looks like the 161-352N-EX will do. It is mono and fits according to the datasheet. I'm building a Tellun Neural Agonizer right now. A number of possible modifications are mentioned in the documentation, namely variations of some of the R and C values of different filters, etc. I've left most of these resistors/capacitors unmounted so far. Are there any of these modifications that might be useful to have selectable via switches on the front panel, or should I just go for the default values? Or - as a compromise - mount sockets on the PCB, letting me put in different component values to try them out? What would you recommend? I've happily stuffed my NA boards, and am now at the stage of going through the calibration stage. I've tried the steps explained in the PDF build document, however I seem to be getting unexpected readings on my 'scope. I measure the square wave from my MOTM300 and it looks like a square wave on the scope (all good!) but when I test at the points mentioned in the build document and adjust the trimmers; they don't seem to have any effect. The document suggests that I should be seeing some signal in both pos and neg, but all I get is a flatline that is so far below the zero that I have to adjust the voltage sensitivity on the scope to see it. I've built quite a few modules now, but only just got my 'scope which is a 20mHz analogue beast sat on my bench. I'm a bit of a noob using scopes so need a few tips on using it in the calibration stage of the TLN-156 build. Here's my 5u Moog panel layout - thought I'd share it, and maybe get some feedback. Feel free to use as you need it. I've put the Hi-Res PDF, the original Illustrator CS3 file, and a JPEG. Very nice! 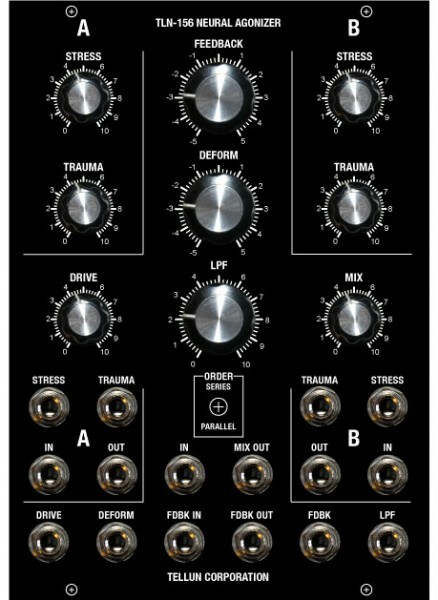 After using mine for a few years I'd suggest grouping the feedback and LPF knobs together, and put the deform knob up on top - switching the deform and feedback knobs. The feedback and LPF knobs kind of work together. No ideas on your electrical issues - does the thing work otherwise? Thanks sduck - that's some good advice; I haven't finished building it yet so had to guess which knobs would be the most important for twiddling! Think I haven't finished building it yet so gonna put it together this weekend and see how it sounds - can't wait to hear the springy drones! I 'finished' mine this week, but during the calibration for TP6 and TP7 I noticed a high frequency sine at pin 7 of U4. I guess that's bad right? But having an unwanted sine is a new debug task for me. I have no clue where to begin my search for the error. Any tips would be highly appreciated. Some Op Amps will get high frequency oscillation unless you put a small (10pF or so) capacitor across their feedback resistors. This compensates for input capacitance, I believe. Without a schematic that's just wild speculation, but I'd say it's worth checking out. On U4 the feedback resistor for the half including pin 7 as output is R80 with 36K and there is no capacitor in parallel. I used the specified TL072 there. I thought they are not that much sensitive for self oscillation. Yeah, did that, it worked and so I put the 10 pF in there permanently. Thanks for the help. Now everything seems to work, so I just have to put the knobs on and then it's finished. Posted: Thu Jun 26, 2014 1:48 am Post subject: old tanks...S2FC2A1B.....will these work?? I was lucky enough to get a set of TNA boards with the bunch of Ken Stone modules I bought last year. I now have time where I can work on what I love most.